Veteran playwright Richard Bean brings his new play, The Mentalist, to London starring award winning comedian Stephen Merchant in his West End debut. Merchant made his name as a stand-up comic as well as in his successful collaborations with Ricky Gervais in The Office and An Idiot Abroad. Merchant is joined by prolific TV and West End actor Steffan Rhodri, who is known for playing the hilarious David Coaches in Gavin and Stacey as well as appearing in Harry Potter and The Deathly Hallows: Part 1. Recently Rhodri has been seen on the West End in Alan Ayckborn’s Absent Friends. Written in 2002, The Mentalist is a two hander set in a nameless hotel in Finsbury Park. Stuck together in a hotel room two men, Ted and Morrie, are forced to confront the darker undercurrents of their distinctive relationship. Things begin to get somewhat tense between the men, building to a tale of friendship and madness. Richard Bean has said that he feels the plays themes and discussion threads will tie in perfectly with election year. The Mentalist will be directed by Abbey Wright with designs by Richard Kent and lighting by David Plater. 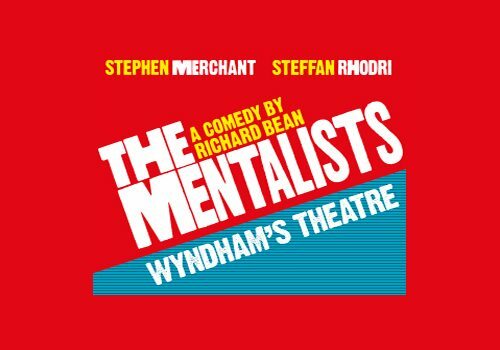 The Mentalist will run for a limited season from 3rd July to 26th September 2015 at the Wyndhams Theatre on Charing Cross Road. The Mentalist is not a children's show, nor is it aimed at children.